Fast 24 hour turnaround for your Mac screen repair with nationwide mail-in service available. Liquid damage repair including component level logic board repair. Start with our free liquid damage diagnosis. Get flat rate data recovery with a no-data no-charge guarantee. Available nationwide with free shipping. Call us with any questions or click below to chat. We are proud to offer a 90 day warranty on all our computer repairs. The warranty covers the parts installed as well as the labor for 90 days. Before you ship your computer out for repair to any repair shop, check their reviews! You will find our customers are overwhelmingly pleased with our services. Learn all about us here. We offer MacBook Air screen replacement for every model of the modern MacBook Air from when it was introduced in 2010 to the present model. In order to complete the Macbook Air cracked screen repairs, a time intensive process must be finished to remove the cracked LCD panel and install a brand new display panel. We are one of the few shops in the nation that offer the MacBook Air screen repair with a 24 hour turnaround. After completing repairs on thousands of apple laptop screens, we can confidently say we are MacBook Air screen repair experts! Whether you have a 13 inch or 11 inch MacBook Air, we can fix it. 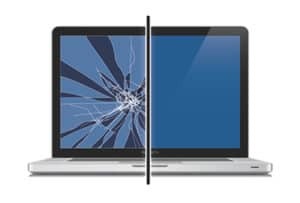 Whether you need an older model MacBook Pro screen repair or a newer Macbook Pro Retina screen replacement, we can replace your damaged macbook pro screen with a new display to get you back up and running as soon as possible! 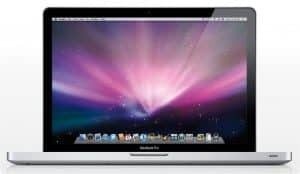 If you have an older MacBook Pro with a DVD slot with a cracked screen, you may need just the glass replaced, just the LCD replaced, or both the glass and the LCD replaced. Nomatter which panel needs replaced, we offer MacBook Pro screen repair at lower prices and faster turnarounds than most Apple Stores. Our MacBook screen repair services are available for every model MacBook from the original white and black models to the brand new 12″ retina MacBook. The MacBook screen repair cost is kept as low as possible by only replacing the broken macbook screen LCD rather than replacing the entire display assembly. 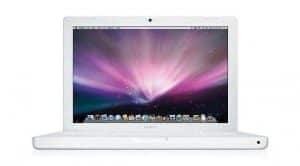 This allows us to offer MacBook screen repair at a lower cost than most Apple stores. We understand that when your macbook screen is broken internally it makes it very difficult to get work done! Trust us to replace the LCD panel on your MacBook. 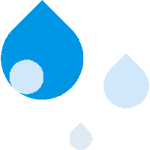 Liquid damage repair cost can vary quite a bit depending on the damage suffered by the Mac. 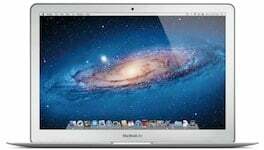 In some cases the only thing needed to get the computer back up and running is a Macbook Pro battery replacement or other low cost repair, wile other times the logic board will be ruined and require replacement in addition to the screen being damaged. In some cases the damage is so bad it is cheaper to buy another computer rather than repair the damaged one. Because there is so much variance in the price of repairs, we always start with our Free liquid damage diagnosis. 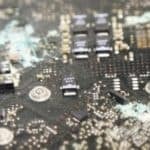 If we find water damage on the logic board, we can offer professional ultrasonic cleaning services as well as logic board component level repair. We offer affordable data recovery services for Macs, iPhones, and External drives. 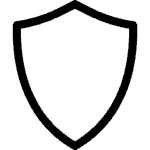 Whether you need data recovery due to a clicking drive, liquid damage, drop damage, deleted files, or anything else, we can attempt to get your important data back. Our no-data no-charge policy and free shipping makes it easy to have us attempt a data recovery. Our flat rate fee structure also ensures there are no surprises along the way. We offer our data recovery services Nationwide through our mail-in service. We understand the importance of getting your cracked or broken Mac screen replaced as quickly as possible. Trying to get work done on your computer with a small section of the screen visible is not a long term option. 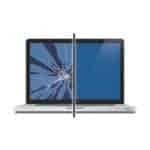 Our Mac screen repair services provide you with an alternative to Apple’s high cost screen repair. Whether you live next door, or across the world, our screen repair services are the best in town! We provide the best service by focusing on three things; communication, speed, quality. We know how it feels when you bring a piece of equipment in for repair. You want to know what is wrong with it, how much it will cost to fix, and how you can keep the issue from happening again. And you want to know these things as soon as possible. At Mac Screen Repair, we keep you in the loop from the beginning of the repair to the end with our state of the art email system. 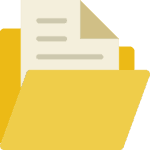 You will receive regular email updates throughout the process including when we receive the computer, when we start working on the computer, when the computer repair has been complete, and when the computer is on its way back to you! Steve Jobs told how his father taught him to paint the back of the fence as well as the front, even though it would not be seen. We use the same approach here at Mac Screen Repair. We aren’t the kind of shop to leave screws out, mount the screens without adhesive, or scratch the computer on a dirty work bench. You can trust us to provide your Mac screen repair with the highest quality workmanship possible.